Soft and chewy peppermint flavored sugar cookies dipped in white chocolate and covered with colorful peppermint candy, it’s the perfectly festive Christmas cookie recipe! A nice change from all the classic cookie recipes and they’re easy to make. 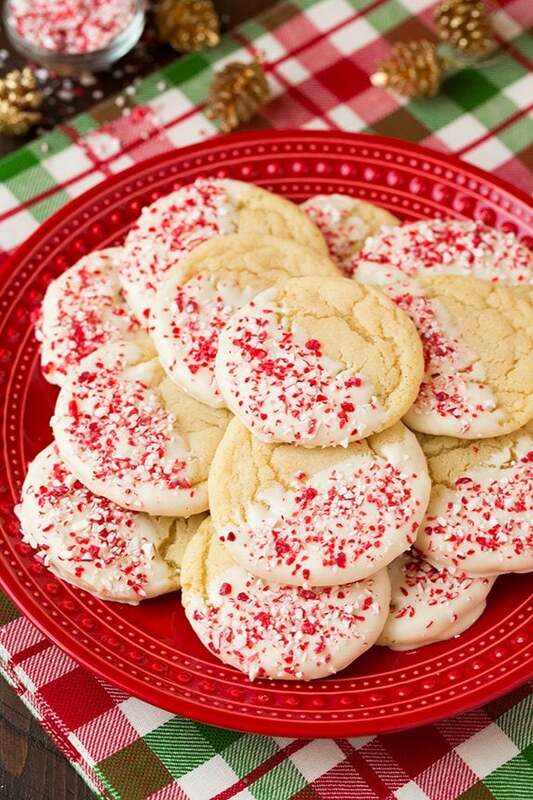 Sugar Cookies with Peppermint and White Chocolate! 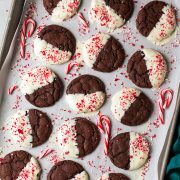 During the holidays I love to make peppermint everything so I decided to come up with a festive peppermint version of a chewy sugar cookie (last year I did soft peppermint sugar cookies so I wanted to try chewy this year). 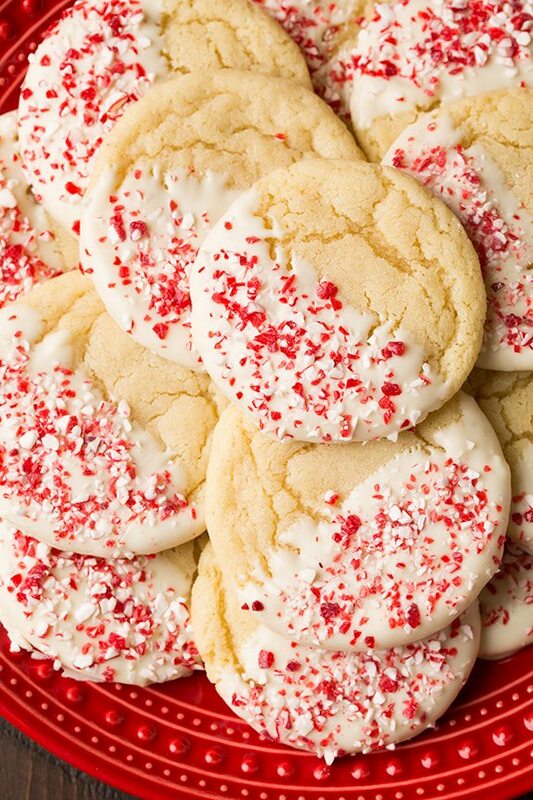 What would make a cookie more festive then dipping it in white chocolate and covering it with peppermint candy? 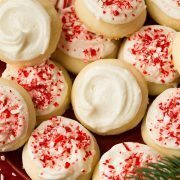 This is one of the ultimate Christmas cookies oh and these White Chocolate Dipped Ginger Cookies – I absolutely love both and they should each definitely find a place on your holiday cookie tray! Everyone loved these and I’m sure I’ll make them again and again! And just fyi you could also use vanilla almond bark or real white chocolate for these too. 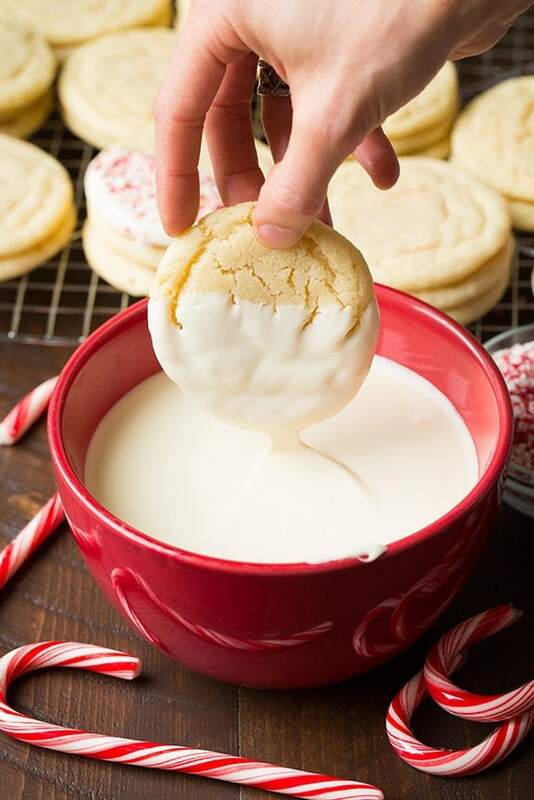 Break out your mixer and getting baking because it’s that time of year, and what better place to start than with these irresistible White Chocolate Dipped Peppermint Sugar Cookies?? Soft and chewy peppermint flavored sugar cookies dipped in white chocolate and covered with colorful peppermint candy, it's the perfectly festive Christmas cookie recipe! 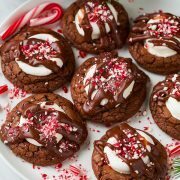 A nice change from all the classic cookie recipes and they're easy to make. For the cookies: Preheat oven to 350 degrees. In a mixing bowl whisk together flour, baking soda, salt and cream of tartar, set aside. In the bowl of an electric stand mixer fitted with the paddle attachment, cream together sugar and butter until combined. Mix in egg then mix in egg yolk, vanilla and peppermint extract. With mixer set on low speed slowly add in dry ingredients and mix just until combined (dough with will thick, so stop mixer and mix by hand to get flour at bottom if needed). Scoop dough out 1 1/2 Tbsp (about 33g) at a time and shape into balls. Transfer to a baking sheet lined with parchment paper or a silicone liner, spacing cookies 2-inches apart (chill dough balls that aren't currently baking in refrigerator on plates). Bake in preheated oven 10 - 11 minutes (cookies should appear slightly under-baked). Remove from oven and allow to rest several minutes then transfer to a wire rack to cool completely. For the white chocolate: Place chocolate chips and shortening in a medium microwave safe bowl and heat in microwave on 50% power in 20 second intervals, stirring well between intervals until melted and smooth. 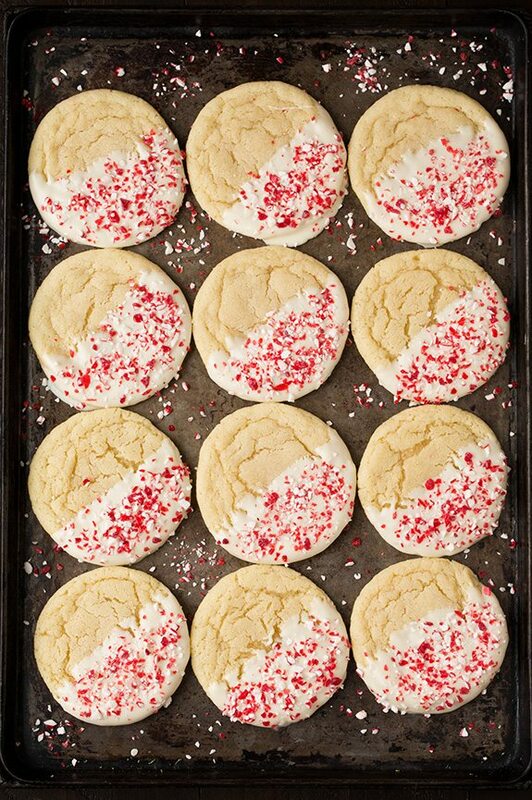 Dip half of cooled cookies in white chocolate allowing excess to run off (or slide bottom slightly along edge of bowl) then transfer to wax paper and immediately sprinkle with peppermint bits. Allow to set at room temperature or in refrigerator. Store in an airtight container at room temperature. Melted baking white chocolate or vanilla candy melts will work great here too, then omit the shortening. Seeney McIlrath: Do you have to put the peppermint extract in them?